In perceiving and revealing it to us in a language that, at its own level at least, has changed palpably over the centuries, the Kavi has himself contributed to the expression and, always in this respect, the hymn as we have it is very much paurusheya. So the revealed veda or Sabda is both apaurusheya and paurusheya. Abstract: This paper was first written in 2007 for the Centre for Sanskrit Studies (in JNU) but has been revised since. It argues that apaurusheyatva and nityatva can be found only in a deeper level of language where operate entities like the kārakāṇi as distinct from the vibhaktayaḥ ‘declension-cases’. 1. Can these two qualities ‘non-humanness’ and ‘eternality/universality’ be found in any aspect of language as we know language in our times – beyond the akshara sounds? It is an axiom of the Mīmāṃsā philosophical system that the Veda is apaurusheya ‘of nonhuman origin’; it is also nitya ‘eternal, universal’. The Veda is, of course, the three Vedas – ṛk, yajus and sāma. This triad is known also as trayī vidyā ‘triple knowledge’. This is another meaning of veda ‘knowledge’– and the triple knowledge pertains in another sense to the material world, the divine (or mental) and the spiritual. So knowledge too has apaurusheyatva ‘non-humanness’ and nityatva ‘eternality, universality’. Moreover, as has often been observed, the Veda was called Sabda ‘word, sound’ both in the PurvaMīmāṃsā and the UttaraMīmāṃsā or Vedānta (Pandurangi 2006; Raju 1971). So by a simple extension apaurusheyatva and nityatva belong to Sabda also. This view is much older than the Mīmāṃsā and other philosophical systems. We do not know the exact dates when these systems were formulated (absolute dates given are conjectural), but in the forms we now have them they are certainly post-Vedic and just as certainly, they presuppose the Upanishads (Up, hereafter) and the hymns of the (gveda. In the Upanishads the philosophical doctrine has the general appellation Sabdabrahman ‘the Word [is] Absolute’ or ‘the Word [is] the Holy Power’; naturally, brahman is both apaurusheya and nitya. The Sabdabrahman doctrine is found fully developed in the Vākyapadīya of the comparatively late philosopher-grammarian Bhartṛhari (late 5th cent CE?) with its four states: vaikharī gross, spoken and written utterance; madhyamā mental, but with most features of the gross language; paSyantī spiritual, undifferentiated, full of potential and outside all common experience (=silence); parā the absolute state, beyond description (VP 1975; Aklujkar 1990). But we find it enunciated in the Maitrī Up 6.22: dve vāva brahmaṇī abhidhyeye SabdaScāSabdaSca ‘two brahman aspects are to be meditated upon, one of sound and one of silence’; the passage further says that by Sabda alone is the silent one revealed and ends with the indication – ‘Sabdabrahmaṇi nishnātah para) brahma adhigacchati ‘whoever is well versed in the sounding brahman reaches the supreme [silent] brahman’. In other words, through the manifest gross language one can reach the Supreme which remains unmanifest in its own sphere. The Bṛhadāraṇyaka Up 4.1.2 changes the terms somewhat: it substitutes vāk for ‘Sabda saying emphatically vāg vai brahma ‘speech/language indeed is brahman, the Absolute’ and that brahman should be approached/worshipped as prajñā ‘intelligence, wisdom’. This formulation takes us through the Aranyakas and Brāhma(as back to the Rigveda where vāc, a mighty goddess as well as the speech of man, stands in place of ‘Sabda. In one of the best known passages of those Hymns we find catvāri vāk párimitā padāni ‘speech/language has been measured out in four divisions/levels’. These are not named but the same stanza tells us that while the three higher ones lie hidden (gúhā), turīya) vacó manushyā vadanti ‘men speak the fourth (lower) level of speech’ (RV 1.164.45). Stanza 35 says that brahmāyam vacáḥ paramá vyòma ‘the brahma (=sanctity) is the highest heaven (=abode) of Speech’. 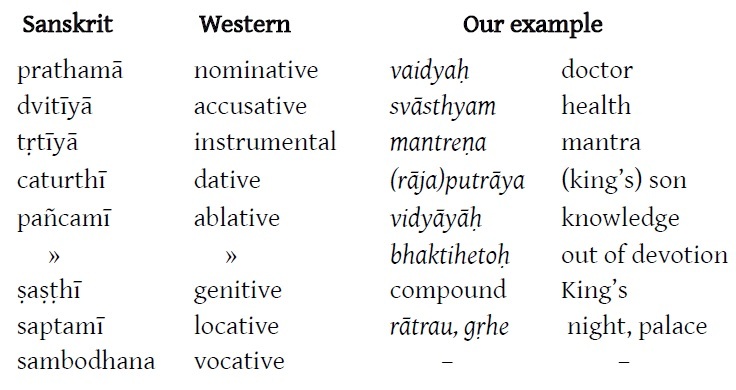 Plainly there is no reason not to take the four levels of Speech Vāc here as corresponding to, and being the basis for, the four states of Bhartrhari’s view of language. 2. Having accepted the Mīmāṃsā general axiom that vidyā and ‘Sabda (or vāc) have ‘nonhuman origin’ and ‘eternality’, can we find these qualities or a reflection of them in an actual spoken and written language like English, Hindsh or Sanskrit? Yes, we can find them in the Kārakāṇi ‘factors contributing to the start, continuance and completion of an action’ as given in Pānini’s Ashtādhyāyī. The dhātu ‘root, seed-element’ also has them as well as the akshara ‘basic phonemes of language’ as distinct from enunciated sounds in speech (or letters in writing). Now it is observable that all sounds (belonging to the general category of dhvani and being called varṇa) have beginning and end. They are uttered by humans, manifest briefly and disappear into silence: thus they are both paurusheya and anitya. The thinking in words that precedes it, as much as the spoken utterance itself, belongs to the ordinary human condition and has beginning and end: this too employs linguistic elements (vocables, verbs, nouns etc) that are man-made and are subject to change. Thus French has different sounds, words, idioms, syntax etc from Italian, even though both languages derive largely from Latin. Similarly Bengali and Marathi differ in all these aspects even though both derive largely from Sanskrit. These differences have come about through human everyday use and to a degree, through contact with other, alien languages. The ordinary aspect of these languages is very much paurusheya. And since the pronunciation and meanings of their lexemes (nouns, verbs etc) have changed over the years, nityatva also is absent. On the other hand, a is a always and everywhere: hence we have the term akshara ‘indestructible’ – which applies to all phonemes (i, u, ka, ta, kha, tha, etc) in this their eternal aspect. This aspect obviously does not belong to our common human usage, characterized by mutability (vaikharī and madhyamā); it belongs to the pashyantī level of language. This must be classed as apaurusheya and nitya. There are other human phenomena or experiences that are universal and fall outside the range of ordinary volition or intent. One such common phenomenon is love. All people throughout the world and throughout history love something or somebody. That love is a universal, eternal state is indicated also by the common idiom “to fall in love”: so here we find nityatva. In addition, we don’t choose to fall in or out of love and don’t know why or how this happens. Only after the event do we try to find reasons and rationalize it. So, in this sense, love has also apaurusheyatva. The same holds for some other human experiences. Everybody has a desire for (more) knowledge – and consequently people read various publications or ask questions and so on, but, again, we don’t know whence this desire comes. Such human experiences, too, at least in their inception, must belong to the paSyantī level and must have nityatva. 3. We can now simplify the four-level scheme into two levels and so deal more clearly with our subject – but must not get carried away into thoughts of duality since the scheme is single and our analysis is given only to facilitate understanding. The two levels can be and have been termed “surface structure”, corresponding more or less to Bhartrhari’s two lower states vaikharī and madhyamā, and “deep structure”, corresponding largely to the paSyantī state; or we can talk even more simply of gross and subtle levels/states. Clearly the qualities of non-humanness and eternality will be found in the subtle aspect or the deep structure of language. There seem to be at least three features of language that belong to the subtle aspect of language and have apaurusheyatva and nityatva. One is the aksara which we touched upon in the preceding section. The other is the dhātu the study of which is most revealing. The third one is the kārakāṇi. The dhātu would require a separate and lengthy study since it touches on the origin itself of languages (for some preliminary thoughts on this see Kazanas 2007, §22). In this paper we concentrate on the kārakas as ‘contributors to the action’ expressed by the verb. 4. At the start we need to make a clarification. We have actions (or transitive movements) and states (or intransitive conditions). In ultra-modern linguistics we meet new terms, thought to be “scientific”, but they add little to the distinctions I make here, so I leave them aside. The verb in every statement in the ordinary language denotes an action and is categorized as “transitive” or a state and is termed “intransitive”. Although there are important and valid differences between the two, yet one can be translated into terms of the other. The simple “I sit/stand” (intransitive) can be rendered into (transitive) “I have moved my body to a condition where I sit/stand”; or the transitive “I kick the ball” into the intransitive “[You see that] I am in the state of having my leg kicking the ball”. Some details change but the core meaning is unaltered. Hereafter I shall use only act/action (transitive) for simplicity. But we should note also the PrātiSākhya definition of verb: We have tad ākhyāta- yena bhava- sa dhātuḥ (12.5) ‘a verb is that by which we mark existence, which is a dhātu; but in 7 is added: kriyāvācakam-ākhyātam ‘the verb expresses an action’ (Müller 1859: 161-162). It is interesting to note in passing that both Yāska in Nirukta and Aristotle in Poetics ascribe to noun being/existence (embodied) and to verb being with a temporal continuity. his knowledge and his devotion to the king. 5. Before we delve into the “deep structure” of this statement, we need perhaps to distinguish between the contributing factors kāraka and the cases of nouns vibhakti. English has not much inflexion and compensates for this with the use of prepositions. So do many other languages – French, Spanish, Hindsh etc. Sanskrit has a very full system of inflexion; other languages like Latin, Greek, Russian and Lithuanian are not quite so full as Sanskrit but do have rich declensions of nouns. Here the health svāsthyam, which was the object (in the second or accusative) in the active construction of our sentence now becomes the grammatical subject in the nominative prathamā and the doctor, who was the subject in the nominative, now appears in the tṛtīyā instrumental – even though he continues to be the actual subject/performer of the action. The names “nominative, accusative” etc are therefore misnomers. 6. The Indian grammatical tradition distinguished between vibhaktis and kārakas – and very rightly so. The former belong to the surface or gross aspect of language and are subject to human intervention and mutability. The latter form an aspect of the deep or subtle structure which is universal and invariable. Although it is possible that earlier wise grammarians and/or philosophers made the distinction between the two, the glory now goes to Pā(ini who actually left us the earliest extant formulation of the two linguistic categories in the fourth section of the first book of his Ash,ādhyāyī. Below I present the sḥtras defining the six kārakas in the sequence given in the Ash,ādhyāyī – since this has some important philosophical nuances. dhruvam apaye’ pādānam (1, 4, 24): the immovable/ permanent in any departure is the apādāna ‘the source’. This is the cause. karmaṇā yam abhipraiti sa sampradānam (1, 4, 32): whomever someone intentionally approaches with a deed, that is sampradāna ‘the recipient’ (i.e. the indirect or further object). Thus we have a movement, a giving away (apa+ā-dāna) from what is immovable relatively to what moves and this reaches a recipient. sādhakatama) karaṇam (1, 4, 42): what is most beneficial/ efficacious, that is karaṇa the instrument’ [for the completion of the action/movement]. The action, the giving away or movement in 1 and 2 above is done through some efficient means or instrument. ādhāro ’dhikaraṇam (1, 4, 45): what holds [the action] is adhikaraṇa the overseeing, surrounding [i.e. the framework or environment of space and time wherein the action unfolds]. kartur īpsitatama) karma (1, 4, 49): what is most beloved of the agent/performer kartṛ that is karma ‘the immediate workobject’. svatantraḥ kartā (1, 4, 54): kartṛ ‘the agent/performer’ is independent (self-extending and having his own system), i.e. the actual/real subject. out of his knowledge and his devotion to the king. Here I give two causes/sources (apādāna), the devotion bhakti and the knowledge vidyā (efficient and material causes respectively). The recipient (sampradāna) is the king’s son rājaputra – the indirect object. The instrument (karaṇa) is the mantra – whereby the restoration of health is effected. Night (rātrī) and palace (nṛpagṛha), both are the environment wherein the act of health-restoration is performed. The object karma of the doctor/performer, what he wants most, is health svāsthyam. Finally, the agent/performer kartṛ is the doctor who has an independent connexion with the system of knowledge out of which he selected the most efficient mantra for the cure. 8. One could go on to a much more detailed and extensive analysis of the philosophical aspects connected with the six kārakas but this would carry us too far from our immediate object – the identification of non-humanness and eternality in language. Of course, this too is a philosophical matter and one could argue that all kārakas are ultimately manifest forms of the One Absolute in the play of creation. What the readers must realize (if they have not done so already) is that the six factors are always and invariably present in every action even if we don’t see them all in every case. One may object that impersonal statements like “It rains” do not have the six factors. However, a little reflexion would show that rain falls from some apādāna (cloudy sky) and is received by the soil and water-masses, in the rivers and oceans (sampradāna). On the one side it fertilizes the seeds in the earth and on the other it is a stage in the cyclical movement of water>steam>rain>water. This is effected through the instrumentality of heat, air and cold (karaṇa). The natural scenery or environment, the water masses on the earth, the atmosphere, air currents etc, constitute the adhikaraṇa. The rainfall itself is the immediate object karma and the kartṛ is the natural water-cycle. In old mythologies there was a god, Zeus in Greece, Enlil in Mesopotamia, Parjanya in India, who generated the rains and storms. All these are non-human. One may also object that the performer is often human, like the doctor in our example. True, but what ultimately is the origin of human beings? And when we act as humans having our own purpose, as we see it then, can we be absolutely certain that we are not, all unbeknown to us, propelled into action by forces beyond our ken? For instance, I know that I derive great pleasure in writing this essay and hope to please the editor, and also acquire some fame among the scholars who read it. But it is very probable that there are subtle forces that have caused me to write this paper for purposes unknown to me. In addition, humans have non-human, or at least unknown, derivation in that, beyond their material embodiment, their origin and their source of intelligence, life, energy and perception, belong to a level not usually associated with ordinary gross humanity: these attributes are not strictly of our own making, though we can extend or develop them. Thus the kārakāṇi, implicit in every statement, exhibit the two qualities postulated by the Mīmāṃsā philosophy. 9. However, there is another aspect – philosophical and historical at the same time. The native tradition states, as we saw (§1), that the Veda, whether as pure knowledge or as the sacred lore enshrined in the Vedic Scriptures, is apaurusheya and nitya. The ṛ*is who actually communicated, say, the hymns of the (gveda did not really compose them but heard/saw them at some otherworldly plane and then expressed them: the hymns were and are always there unchanging beyond our common world of change. Nonetheless, we know of RV 1.164 hymn because Dshrghatamas Aucathya heard/saw it and revealed it to us. I could not perceive this nor can millions of others. In this respect, in perceiving and revealing it to us in a language that, at its own level at least, has changed palpably over the centuries, the Kavi has himself contributed to the expression and, always in this respect, the hymn as we have it is very much paurusheya. So the revealed veda or Sabda is both apaurusheya and paurusheya. But here another thought presents itself from some unknown depth of the mind. ‘himself in all beings and all beings in himself ’ (6. 29). But this is quite another matter. Aklujkar A. 1990 ‘Trikāṇ1ī or Vākyapadīya, with Vṛtti on Books 1ī2’ in H.G. Coward ī K. Kunnuji Raja eds, The Philosophy of the Grammarians vol 5, Encyclopedia of Indian Philosophers, N Delhi, M-Banarsidass ī Princeton University Press (pp 126-172). Kazanas N. 2007 ‘Greek Logos, Vedic Vāc: Creative Power’ in Dr Sh.Kumar ed, Sanskrit across Cultures Special Centre for Sanskrit Studies, JNU, N Delhi, Printworld. Kemp A. 1991 ‘The emergence of autonomous Greek Grammar’ in P. Schmitter (ed) Geschichte der Sparchtetheorie vol 2, Tubingen (302-333). Law V. 2003 The History of Linguistics in Europe… Cambridge, CUP. Müller F. Max 1859 History of Ancient Sanskrit Literature, London, Williams ī Norgate. Pandurangi 2006 ‘PurvaMīmāṃsā Perspective on Veda as Word’ in Dr Sh. Kumar ed, Veda as Word Special Centre for Sanskrit Studies, JNU, N Delhi, Printworld. Raju P.T. 1971 The Philosophical Traditions of India London, AllenīUnwin. VP= Bhartṛhāri’s Vākyapadīya, kāṇ1as 1ī2 ed and transl K. R. Pillai, N Delhi, M Banarsidass. Most of Müller’s observations are quire illuminating. His dates, however, which have become mainstream doctrine (RV 1200 down to Sshtra period 200 BCE) are hopelessly late, based as they are on his identification of Kātyāyana with Vararuci from a ghost story in Somadeva’s Kathāsaritsāgara(c 1100 CE) assigning the sshtrakara to c 300 (Müller 1859: 240-244). Although later Müller himself repudiated those dates suggesting for the RV 3000 or even 5000 BCE, they have stuck and bedevil Indology even to our days. currently on the Editorial Board of several Journals of India.